There is nothing more certain than the fact that we will face adversity. Some of this will be natural. For example, if we want to learn to hang glide or do technical mountain climbing, we will find gravity to be a serious adversary. But this is not a personal thing. Gravity adversely affects everyone who tries to go against it. We understand this and we can easily accept it in evaluating the benefits or the consequences of our choices. We decide to go on a diet this year and are suddenly surrounded by all our favorite foods in abundance. So do we accuse the hostess at our Christmas party of personally attacking us? Not if we want to be invited back. Though this kind of opposition to our commitments can feel almost personal, we recognize it as a natural thing. We realize that as soon as we have made a commitment we will have opportunity to blow it. The universe just seems to work that way. What is harder to deal with is when we face personal opposition to the things we value and decisions we make. Sometimes this opposition is appropriate because we have made a bad decision and those who love us are trying to help us see that what we want to do is harmful to others or ourselves. Such godly opposition hopefully comes in the form of honest disagreement, but without efforts to either control or punish us. These are “the wounds from a friend,” of which Proverbs 27:6 speaks. Other times the opposition we face is of a more aggressive kind, and involves a person or group going out of their way to “pursue” us (push us) to change or to punish us for not doing so. This falls into the category of “persecution,” something that literally means “to be pursued or chased.” God’s Word says that all godly people “will be persecuted” (2 Tim. 3:12 NRSV). The verb is in the indicative future passive, and thus simply states a future fact. The only way to get out of it is to not live in a godly way, and even then we’re going to feel hounded by the consequences of our sins. So if persecution is part of the program for a faithful believer, how are we supposed to deal with it? 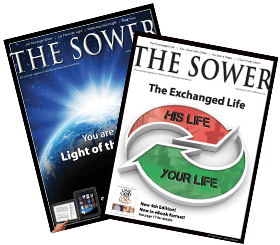 Jesus addresses the subject directly, in the context of “the parable of the sower.” The immature will allow persecution to prevent them from growing up spiritually (Matt. 13:21). No, the fact is, we are supposed to learn to endure persecution without retaliating as a necessary part of following the Lord. Learning to do so is an important way of demonstrating that we believe that God is our sufficiency. We learn to take solace by doing our best to be faithful to Him and to accept the consequences of doing so in a fallen world orchestrated by the Devil, and antagonistic to godliness. There is another important reason to learn to endure persecution with no desire for revenge. That is, in seeing ourselves as victims of persecution, we could turn into persecutors ourselves. How could that happen? It happens according to the Drama Triangle, a concept popularized by Stephen Karpman, M.D. in an article he wrote in 1968, but clearly evidenced in Scripture. The triangle is formed by three interacting players: the persecutor, the victim, and the rescuer. Each role plays off of the others, and traps each player in a dramatic cycle that tumbles them around like they were in a dryer. Once you start playing one role you will play them all eventually. The persecutor is the villain who attacks the victim, who then cries out for help. Enter the rescuer who thwarts the persecutors evil plans and saves the damsel in distress. Variations of this theme abound in literary and cinematic art. For our purposes here, we just need to understand that most persecutors perceive themselves as victims protecting themselves from being victimized again. The way to break out of the Drama Triangle is to forgive, let Jesus do the rescuing, and leave vengeance to God. It is a sad reality that most humans who are guilty of persecuting or abusing others are just perpetuating evil that was perpetrated upon them. Victims of child abuse abuse their own children, and so on. Unless we learn to forgive in the depth of our hearts and bless those who have persecuted us, we will unconsciously continue their practices and create victims in our own wake. We are most certainly in a spiritual battle, and thus are subjected to a variety of “flaming arrows of the evil one” (Eph. 6:16 NRSV). But we must be careful not to over dramatize this, or to attribute to the Devil and his minions what is only natural opposition and adversity. If we become “super-spiritual” and see the Devil and demons behind every hindering circumstance, every criticism, or anything that makes us feel bad, we are going to start developing a persecution complex and even paranoia. This happens when we over-personalize the spiritual battle. Well, if we have a personal adversary, shouldn’t we be taking it pretty personally when we get attacked? First of all, we must remember what the Word says in 1 Corinthians 10:13 (NRSV), “No testing has overtaken you that is not common to everyone.” Tires are going to blow, sleet is going to fall, arguments are going to happen and friends are going to betray us. In all these things we are still “more than conquerors” and can see the hand of our delivering God, to whom we must keep looking steadfastly. When we over-dramatize the adverse circumstances and invest them with all kinds of spiritual significance, we may just be setting ourselves up for more spiritual problems as well as look pretty silly in the process. No doubt when Titus followed Paul’s advice, these people felt “attacked,” and probably thought that the two men were “persecuting” them. But there is a big difference between speaking truthfully in accordance with Scripture (and with a godly motive) and misleading God’s people away from sound teaching and practice. We must stick with Paul’s exhortation to Timothy, “to preach with sound doctrine and to refute those who contradict it.” Sound doctrine concerning persecution is that we endure it patiently, responding not to defend ourselves but to affirm the truth of God’s Word and to protect His people from evil. Again we must avoid the extremes—of living to avoid persecution or becoming so used to it that we become indifferent to it. We need to learn to endure it patiently, pray for mercy on those who persecute us, let the pain remind us of Jesus and all he went through for us, and keep faithful to our calling despite opposition.